What’s Been Rockin’ My World? What’s been keeping me busy these days? Many things, one of which is connected to an amp and has helped a couple of thousand kids and their families rock out this summer. It’s the Tricycle Music Fest, boys and girls! And it has been an incredible experience. There’s more than one way to rock a library–well, several libraries. Music brings da people together! 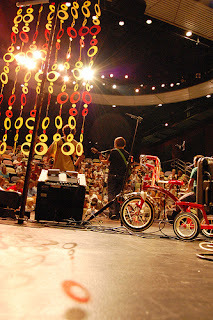 I attended all three concerts for the Tricycle Music Fest – what an amazing FREE concert series! I was already a huge Dan Zanes fan, but the big surprises were Lunch Money and The Jellydots! I can’t wait for the new Lunch Money CD to come out – what a great band with amazing lyrics and musicianship. I hope that PLCMC continues to provide events like this for families in the future! Sign me up for the Second Annual Tricycle Music Fest! P.S. How about some They Might Be Giants next year?